Is the Long Hard Road to Academia Worth It? Why Would a Poor Kid Want to Work in Academia? Um, why should we assume that minorities with science backgrounds going to jobs outside of academia is a bad thing? Perhaps they feel a private sector or a government career would be more rewarding, or those jobs are in locations they would prefer to live in as opposed to university locations? There is something rather patronizing about the implicit assumption that women and minorities are wrong about their own interests and priorities. Perhaps women and minorities are more likely to go to medical school because—gasp—they actually want to become doctors, not teachers of other doctors. But why does the gap exist? Donna Ginther from the University of Kansas wonders if it’s partly because Gibbs focused on medical schools, most of which do not guarantee salary with tenure, and so might be unattractive when compared to other alternatives. Perhaps scientists from minority groups are just seeking employment elsewhere. Gibbs counters that this is unlikely, since almost every sector of academia struggles with faculty diversity. Hiring practices are a likelier culprit. I remember myself and a couple of my postdoc colleagues having a conversation with two really talented young black women who were technicians. We were trying to persuade them to go to graduate school and get on the academia track. They laughed at us. They told us that we were women in our early thirties who couldn’t afford to buy houses or have children, who spent our nights and weekends working, who didn’t have retirement savings, and who were still struggling to get permanent jobs. Why on earth would they want to be like us? I felt they made a good point. I’m not a PhD, but I am a scientist who recently left a Harvard lab to work in Big Pharma and I’m black. I’m sure there’s some discrimination at play, but I would argue that one of the biggest issues here is the pay associated with academic life. I grew up in a working-class, inner-city family in Boston and was bussed 1.5 hours both ways to go to school. I was highly modulated to do well because I saw the lives of my schoolmates that were SUBSTANTIALLY better than mine (median income in my neighborhood of $40K vs median income of $150K in the town I went to school in). I realized education was going to be my way out, so I threw myself behind that 100 percent. In college, I studied 50 hours a week. I was a biology major. This was a total of 16 years of sacrifice in school. Remember, I didn’t have any family wealth, so I had to actually give up stuff to get this education, unlike rich kids who still get family trips and nice clothes while they study. I didn’t know what the professional world would look like, but I assumed a STEM major would get me money. When I graduated and started working at Harvard, I was making $28K a year. Most construction workers made more than I did. I had to live at home for three years because I couldn’t afford rent anywhere. I became extremely resentful because I felt like I wasted all that effort in school for no payoff. But I quickly realized that immunology was super hot. My lab was an immunology lab, and I learned that with three years more of lab work, I could jump out of the academic treadmill and go to where the real money is: Big Pharma. My final annual pay at Harvard was $32K after three years of work. The job I took in the pharmaceutical industry paid $70K, and after a year of working every day, I was given a raise to $90K. Academia is really the land of the trust-fund kids. The pay is so bad, you need to either have a trust fund or a spouse who will support you. Academia requires a life of sacrifice. I had zero interest in sacrificing a day longer than I had to. My boss in academia went to Harvard for undergrad and PHD and had five years of postdoctoral experience. She was making $50K. Black and Hispanic people are disproportionately from poor families, so people like me who have the smarts to work at a place like Harvard aren’t all that interested in making $50K a year. You have the chance that no one in your family ever had to be rich. Why waste that? Someone has to generate wealth for the family. A large percentage of black people know economic struggle. We aren’t likely to take on the burdens of education if it’s not actually going to improve our living standards. You can work tons of hours and make tons of money; or you can work more reasonable hours and make much less money but have tons of family time; but why on earth would you want to work tons of hours for no money? We have a word for that. It’s called exploitation. My hours are also better than a science professor. I work 70 hours a week, but that’s by choice. I’m also going to grad school for an MBA. (I want to be a CEO, so I need to prove myself.) My lab is usually done by 5pm. We have some nights that go to 8pm, but that’s not the norm. In academia, 70-hour weeks are the norm. There are only three kinds of people in the economy: owners, management, and workers. It’s incredibly hard to be an owner, so I’m going to be a manager because they can get rich. Workers in the Anglo-Saxon model are always getting screwed. I would rather do the screwing. My goal in life is to be rich. That’s what motivated an inner-city kid to pull 12-hour days from 2nd grade till today. I sacrificed my entire childhood to get to this point. I didn’t do it because I was looking to help people. I’m not interested in sacrificing my life for others. It was made abundantly clear to me growing up that the broader society didn’t care about the conditions I was growing up in, so outside of other working-class kids, I don’t feel like I owe this broader society anything. Racism happens. But I don’t look to blame racism for every ill, nor do I look to pretend racism doesn’t exist like many conservatives do. I was told to pull myself up by my bootstraps and I did. Yeah, enough said—none of the scientists I know would describe “being rich” as among their top life goals. Others of us do it because it’s what we love, not because we hunger for status and wealth. Science is more important than that. That certainly doesn’t mean we shouldn’t be well-compensated, but remember that doing science for its own sake is a PRIVILEGE. Not everyone gets let into this weird, little world. Most scientists agree that to call oneself a scientist one has to have a Ph.D or at least a M.S. and actively contribute to the knowledge of one’s field by publishing regularly in peer-reviewed, high-quality journals. Having an undergraduate degree and working as a technician does not make one a scientist. It seems the responding reader is engaging in exactly the kind of patronizing attitude described earlier in the thread. “Oh, this person wants to get rich, therefore their love of science can’t possibly be as great as mine, who will do it for less pay.” I have no doubt that the responding reader is passionate about science, but it’s pretty low to question someone’s scientific devotion merely because they made life choices you don’t agree with. There’s a July note from Mary that talks about the arrogant attitudes of academia; I’d say this first response is a prime example. One point that's missing from this thread (although maybe also discussed in older notes) that I think is relevant is how the nature of your job changes as you transition from grad student/postdoc to assistant professor. As a student or postdoc, you’re in the laboratory constantly. It’s your raison d’etre. As an assistant professor, your job is to bring in money. It says it right in the job descriptions: “Develop an externally funded research program.” And that means writing grants, all the time, hoping that one of yours is one of the ~30 percent that will be funded. It’s a jarring transition, and for someone who really enjoys being in the lab (like myself), a major drawback of a career in academia. And that’s on top of the long hours and low pay (compared to industry) already discussed. I love science, and I love that my job allows to me spend most of my time in the lab inventing new things. But I love other things as well. Most important, I love being able to come home from work and spend time with my family without worrying about writing another grant, or worrying about my graduate student doing an experiment properly, or worrying about some other research group beating me to a publication. As the reader summed up: “Not everyone gets let into this weird, little world.” Well, not everyone wants to be in that world. I started out on the PhD path in the late 1980s. I was idealistic, hardworking. I believe it was about the time of the birth of my second child—after my PhD and into my second postdoctoral fellowship—that I resolved to leave science. I had really crappy pay. I was able to look through a roster of state salaries and realize that a dental hygienist got paid more than I did. More than that, I simply felt demoralized and undervalued. One point that I did not see made in other posts but seemed relevant to me is that most of my colleagues were foreign nationals for whom a chance at a citizenship was a bonus—which was not the case for me. There was a lot of academic dishonesty as well: plagiarized papers and work, but the offenders were not called out on it because the professors would jeopardize losing their labor pool. Though I mastered a body of knowledge, graduate school and post-doctoral fellowship was the most frustrating time of my life. In my early 30s, I went to medical school and have never regretted the decision. School was a breeze for the most part, even with two little kids. I had the advantage of working long hours for uncertain rewards in the past, so the cycle of school and set exams seemed easier and predictable. Even residency was tolerable—fun actually. I finally felt in medicine that I was on a level playing field. By now, as a partner in a practice, my salary is much larger—on order of 5-10 fold what it would have been on a traditional academic path. But I also feel much more control over my own destiny. Reviewing the paths of many of my graduate school colleagues, I would say at least half left the traditional path of academics to pursue law, business and medicine. I really do feel annoyed at the whining about the United States not training more scientists. We do not pay scientists well, and potential trainees are simply reacting to market forces and taking their talents elsewhere. I take issue with the idea that academics necessarily have horrible lives. I am a freshly-tenured associate professor in STEM at a large research institution. I’m responsible for a medium-sized lab, and I publish at a reasonable clip for my field. So: I have all the regular markers of academic success. I work 40h/week (on average), no weekends and no evenings. About half my work time is unscheduled and flexible. I can take off any given afternoon to sit at home with my sick kid (as I am doing right now) without seeking permission or documenting PTO, which is a lot more than my friends in industry can say. I never have to worry about my manager cutting my hours or scheduling me on the wrong shift, unlike my friends in service-industry jobs. While I’m not rich, my job pays me enough to own a nice house that’s walking distance from my work, unlike my friends in K12 education. There are plenty of ways to be miserable in the professoriate. Let’s stop promoting the myth that working unhealthy hours is required. Update: Read new stories here from black women dissatisfied with academia. Thanks to The Atlantic for several recent articles on this topic, and for the continued discussion in Notes. They really struck a nerve with me. I want to point out two major elements that are missing from this discussion. First, as I experienced it, there were two distinct cultures in the academic world, starting in grad school. There were “writers” and there were “teachers,” and the writers were supposed to be the elite. Teaching was slightly beneath the writers. The writers were expected to do original research, publish articles in leading journals, publish books, and publish at least one “master” work, hopefully winning the Pulitzer Prize. I have no doubt that these people provide the highest and most stimulating work in our profession. However, some of us just prefer to teach. Secondly, there was no mention of jobs at private colleges, community colleges, or state colleges. This omission betrays a prejudice in our professional culture. At some point the writers expect to achieve a senior position at an elite university with limited teaching responsibilities. This seems entirely right to me. However, as several people pointed out, these positions are elusive and highly competitive. My experience was different. From my first semester in college I knew I wanted to be a teaching professor. I eventually realized that my life goals could only be achieved by finishing a Ph.D. The Ph.D. was the only way to join the intellectual community, answer the big questions, and sustain a teaching career. A senior graduate professor recruited me after I had my Masters degree and he offered me a prestigious Ph.D. fellowship to work with him. When I arrived on campus I was given two choices: Research Assistant or Teaching Assistant. As an RA I would assist a professor in the research and writing of an article or a book. This position would prepare me for a writing career. As a TA, at least in my department, I would meet weekly with a mentor, teach my own survey classes, prepare tests, and give grades. I took the TA option. As I imagined my life goals, this was the best choice for me. I realize now how fateful that choice was. After three semesters of doctoral seminars, and research papers, and teaching duties, I was hired as a professor at a nearby private college on the condition that I continue and finish the Ph.D. The college was impressed by my experience as a TA. My college paid me well enough, including benefits. They also provided some tuition assistance and a reduced teaching load while I finished the Ph.D. (I believe that many teaching colleges have similar policies.) When I informed the university of my new job, and resigned the fellowship, several professors expressed their disappointment that I had “left” the academic life. I continued to teach through the Ph.D. When I graduated I received a promotion and a hefty pay raise from the college. I loved teaching five classes with no more than thirty students. Any extra time and energy that I had did not go to research or writing. I stayed current with my academic field, I attended academic conferences (subsidized by the college), and I invested in the life of the college community—exactly as I had imagined it as a college freshman years before. After 14 years at the private college, I accepted an offer from the local community college (now a four-year state college). I missed the community of a residential campus, but there are advantages to working for the state. I am paid well, I have good benefits, I have good students (which is all I ever cared about), and the administration treats its professors like royalty. After 14 years at the state college, I have now completed 29 uninterrupted years as a professor. None of this was possible without the Ph.D. Was it worth it? Every penny. I don’t think this is really a question of “Is a PhD worth it?” Instead, the question should be “When is a PhD worth it?” I think a PhD is worth it when two things are true: (1) the student enjoys teaching and/or research (loving both isn’t necessary), and (2) the student gets a good academic job. You have to love either teaching or research, as other readers have noted. Loving both is a bonus but not necessary. Plenty of faculty love research and view teaching with indifference, and vice versa. This is something that’s up to you to decide. An unwavering belief that what you’re doing is interesting and worthwhile will help you through the inevitable rough times. I focus most of my attention on the second criterion here: A PhD is worth it when you can get a job. Consequently, factors that make it easier to get a job make a PhD more worthwhile. There are two important points that haven’t been addressed in this discussion: mentorship and discipline-specific academic job markets. First, mentoring. As many students can tell you, PhD advisors have a disproportionate impact on not only students’ emotional well-being, but also their careers. If your advisor doesn’t care about you, or doesn’t provide you opportunities to develop, a PhD is absolutely not worth it. Why? Because in order to get a job, you must have good publications. This is true even at teaching-focused universities nowadays. In order to get good publications, you must have good supervision. Without it, your life will be very, very difficult. This point is especially salient when your research is expensive to conduct. When you are dependent on funding and expensive equipment to publish research, you are also dependent on your advisor to secure that funding. As noted, agencies typically aren’t shelling out six-figure grants to graduate student PIs. Unfortunately, not all advisors take this responsibility seriously. They are under tremendous pressure themselves to publish or perish, and training PhD students is a lot of work. In my opinion, faculty should be more explicitly rewarded for mentorship to incentivize better supervision. Second, the nebulously-defined academic job market. It bothers me to hear the countless headlines about how terrible the academic job market is (including this NYT piece just this week), when that simply isn’t true across the board. There are many different academic fields, and perhaps unsurprisingly, the job market isn’t the same in all of them. If you are in a field that churns out a ton of PhDs, you will have a very difficult time finding a job. However, not all academic disciplines are oversaturated with new PhD graduates. If the figures on this graph seem low, consider the fact that not all tenure-track faculty work in departments with PhD programs. To give a balanced perspective, it’s also worth noting the trend where tenure-track positions are more and more often being turned into contract positions (i.e., not tenure-track) after tenured faculty retire. Overall, getting a PhD is a calculated risk. Different factors will make it easier or harder for you to get a job. These points lead to a few concrete recommendations for those weighing the merits of graduate school. These points won’t be equally relevant to every discipline. 1. Find out what the job market looks like before going to graduate school. Talk to newer faculty in your department that just went through the search process, talk to faculty that were on search committees, etc. Use the internet. Does your field do employment surveys? Find them online. 2. Find a good mentor. They are worth their weight in gold. When looking at PhD programs, look at the faculty CVs. Are they publishing regularly? Are they publishing with students enrolled in the program? Does the department have a history of placing PhD graduates in academic jobs? If so, they usually aren’t shy about advertising it. When/if you go for a campus visit, talk to the current students. How are they doing? If you can put yourself in a field that’s hiring with a mentor that’s publishing, you’ll probably be in very good shape. This isn’t a comprehensive list of course, but in my experience, these are two major points. If you can make it through to the other side with a tenure-track job, it’s absolutely worth it. My wife and I are tremendously lucky, so maybe my advice should be taken with a grain of salt. We were in graduate school when the economic recession hit, and we left school after the recovery. We work in a disciple that is not oversaturated with PhD students going into academia. We both have PhDs and both have tenure-track jobs that are within one hour of each other. Our jobs are fulfilling, challenging, and flexible. We’ve paid our dues and are finally seeing the dividends. We finally have enough time and money to make other (non-academic) things a priority in our lives. Our research is up to speed and 60-hour workweeks are a thing of the past. We make enough money to pay both the mortgage and our student loan debt comfortably. If I could go back in time and choose a different career path, I wouldn’t even consider doing things differently. Quite simply, I did not possess the interest or drive for this kind of life. When my son was born, I determined that I would earn a living in a way that provided economic security, as well as time to be there for him. Initially, I was fortunate to secure a non-research position in a government agency. I later moved to the private sector. There is an arrogance about academia that is imparted to doctoral students: that the tenure-track position is “pure” research and the only honorable path for a PhD. Stuff and nonsense. Begin with the rate at which students for a particular advisor may graduate. One per year? One every other year? In a 30-year career, a lab chief may churn out 20 PhDs. There are far too few academic positions to justify this; rather, graduate students and post-docs are inexpensive labor. I wonder about the thinking that keeps trainees believing that they will be the exceptional ones to beat those odds. I love what I do, and those 10 years were worth the opportunity cost. In my 21-year career, I have used my training, and the way I learned to think, most days. Bonus: I have a life outside work. Look around, students: The academic career is not your only, or even your best, option. Bachelor’s degrees are not for all people and all walks of life, and advanced degrees all the more so. I tried to get a Ph.D. in an engineering field. Leaving with a master’s was a great decision, even though it was largely forced on me. Over the ensuing years, I watched my friends who had stayed for the long slog become increasingly bitter. Here’s why. Academic research is the right channel, if not the only channel, for strikingly original, pathbreaking work. Once a field begins to attract private investment, however, academia needs to step back. Once a field has reached a certain level of popularity and recognition, the number of strivers greatly exceeds the number of original directions available, leading to duplicate work and dissertations of little value. In fields (such as mine) that require expensive and temperamental lab equipment, a company can afford to buy the best tools and hire technicians to maintain them. Graduate students waste years fussing over obsolete instruments. And, finally, academia tends to breed faculty with outsized egos who abuse students as a source of cheap labor for their pet projects. Companies, although not perfect, are much better at aligning the interests of frontline workers and management, and at killing projects that aren’t worthwhile. A doctorate remains the minimum credential to be a professor, which is fair. In some fields, though, even companies will not consider applicants who lack doctorates. This is part fetishism, part hazing ritual. In my field, I have found a Ph.D. to be usually valued as much or less than an equivalent number of years of private-sector experience, and we’re all better off for it. All of my comments are in reference to graduate school in STEM disciplines, since I do not have experience in grad school in other fields. As a graduate student considering exiting my program as a 5th year, I can tell you in all honesty that a PhD is not “worth” it—for me, at least. Too many eager students earning a bachelor’s degree in STEM are told that they cannot have a worthwhile career without entering grad school. I saw the PhD as one more hoop to jump before I could land a great job that would provide me with the challenges and stability I wanted in a career. I have learned a massive amount and I don’t regret coming to grad school, but I am increasingly regretting staying. Most of what I will take from the PhD will be things I learned in my first two years. In other words, a master’s degree would have been perfect for me. Unfortunately, master’s degree programs in STEM are not encouraged and sometimes frowned upon. The few master’s degree programs that exist do not usually cover students’ tuition or offer any sort of stipend. At top-tier universities where students can only enter PhD programs, master’s degrees are only handed out as “consolation prizes.” In other words, a master’s degree is a mere exit option for those not able to “tough it out” through the PhD. From an institutional perspective, this makes some financial sense. Why offer a paid master’s program, where students will be novices in the lab and still refining their techniques, when a PhD student will make up for these formative 2 years by effectively “working” 3+ years after the initial phase of their training? This is certainly the case in my lab. I used to fumble with equipment and make rookie mistakes daily. I now train newer students on instruments, assist with experimental design and analysis, and manage a good deal of the lab. I don’t get credit for it, though; I have the same low stipend that I did as a first year. My experience is the norm. It’s expected that you “pay back” for your training in the form of working more and publishing. In fact, certain fellowships require that you financially pay them back if you decide to pursue work outside of academia. Keep in mind that these fellowships are a trainee’s paycheck. If I was awarded one of these postdoctoral fellowships and decided to quit an unhealthy postdoc in month 11, I would owe back 11 months’ worth of my paycheck. If this isn’t indentured servitude, I don’t know what is. Coupled with emotional distress, not knowing where I might be working in a year, the lack of benefits (will I ever be able to retire if I stick with the PhD? ), and an overwhelming desire to do something that I am good at and getting compensated appropriately, I can’t see sticking around any longer. The PhD is not the route to career satisfaction that I envisioned. It is no longer a simple hoop; it’s a long, winding, and seemingly never-ending tunnel. This entertaining but serious essay by history professor Timothy Burke was required reading when I was at Swarthmore almost 20 years ago. It begins, “Should I go to grad school? Short answer: no.” The essay holds up today—and the job market worries he touches on have, of course, gotten incomprehensibly worse. Big thanks to your reader who pointed out Timothy Burke’s essay on graduate school in the humanities! It led me to Timothy Burke’s blog, which has some fascinating viewpoints on current events around globalization, Donald Trump, and the like. Speaking of which, I’m intrigued that so many of the responses on the worth of graduate school are about the sciences rather than the humanities. Is this because the story in the humanities is old news by now? 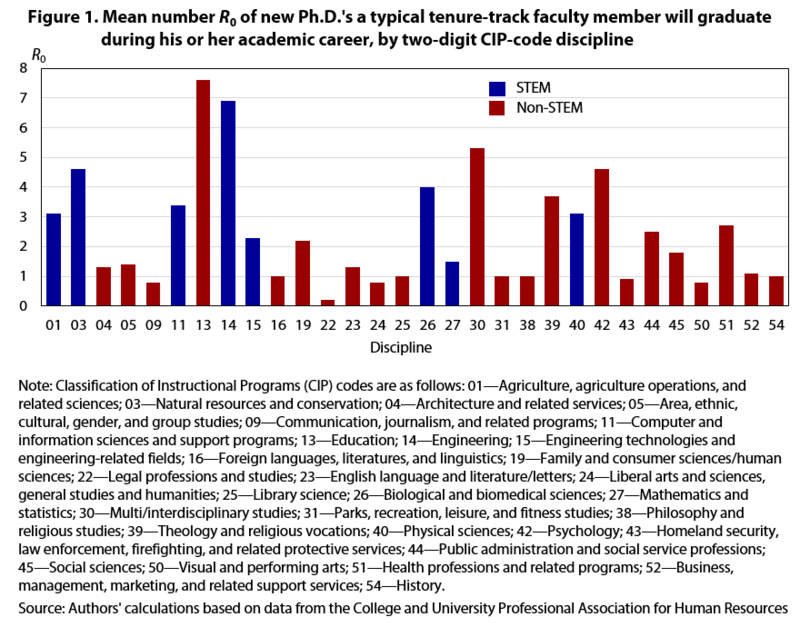 Whereas, in science, you get this weird disconnect between “we need more STEM majors” on the one hand, and the same old math about how many more PhDs there are than tenured posts, on the other. Do we really need more STEM majors? Because a lot of us are pretty worried about becoming unemployed, or spending our lives in badly-paid adjunct posts with no job security. I’m at the end of my 5th year of my PhD and will graduate in the next year. In many ways, I’m lucky. I work in food safety and microbiology. Since everyone wants to know their food is safe, government funding has been cut less, and we can usually persuade industry or trade associations to fund our applied research. However, we’ve been able to do less basic research than we would have hoped, because when funding is tighter, the government funds projects which are more likely to have immediately applicable results (applied research), and industry only funds applied research. So a lot of good basic science doesn’t get funded. So far, yes. As a graduate student I've had opportunities to teach, write grants and fellowships, mentor undergrads, help manage the lab, and work on international development projects. I’ve also seen mentoring failures, abusive advisers, and nasty department politics. It is a hard road to a PhD (though I think attributing “Navy SEAL-like brutality” to it is going too far), but it does offer a lot of personal growth opportunities and the joy of research along with the frustration of repeated failure and impostor syndrome. I plan to stay in academia because there is no other position I know of which combines teaching and basic research and opportunities for international development projects like academia does. So I’ve mentally given myself a few years to postdoc and try to get a tenure track job. I think I have a decent idea of what I'm getting myself into ... we shall see. Research funding is the thing which worries me the most. Is a Ph.D. Worth It Anymore? I am certainly glad that Congress increased NIH funding, but from where I sit as an early-career academic researcher, it’s not going to put a dent in the massive brain drain out of academics. The reason is this: Ours is a terrible profession to work in. Just terrible. Get a Ph.D. (This once took four or five years, but the time to degree is now creeping up to six or seven years.) Get a string of several temporary positions (postdocs, adjunct-ships, visiting assistant professor positions), which are paid very poorly relative to your education level and require you to move cross-country or even internationally every 1-2 years. When I say “paid very poorly relative to your education level,” I mean that people in these jobs get paid the same or less than my friend who is a mechanic. Even so, there are so few jobs relative to the number of newly minted Ph.D.s that many people never even make it this far. Let’s assume that things go well and you eventually land a tenure-track job. At this point, you are probably in your 30s, maybe even in your 40s. You are still not in a very good position. There’s the opportunity cost of a decade or more of low wages. You probably don’t have any significant savings, and you may even be in debt. You probably haven’t been able to start on typical adult financial steps like buying a house or contributing to a retirement account. If you are a woman who wants to have children, your age and declining fertility are a serious problem. Many women are married to academics and have problems finding two positions in the same city, what is known as the “two-body problem.” Many women drop out of academics because family and childbearing are incompatible with having an academic career. That’s assuming you get a tenure-track position. There is a growing academic underclass of people in perpetual adjunct or visiting assistant professor positions who never make it out. I love learning, I love research, and I love teaching. I love that I get to wake up in the morning and discover something new and then tell everyone all about it. But I cannot in good conscience recommend getting a Ph.D. and going into academics. I’m not even sure it was the right choice for me. I have yet to land a permanent position and I’m not sure I ever will. With my intelligence and drive, I could have studied something more practical, made a boatload of money, retired early, and then spent my time doing research from a position of financial security. I’ve always been infertile, so I don’t have to worry about my biological clock, thank God, but if I did, I very well may have already left academics to become a housewife. It makes me angry when people in the government talk about the need to train more people in STEM. We already have plenty of people in STEM. What we do NOT have is enough jobs for them, or enough jobs that treat and pay them as the highly-trained professionals that they are. It especially angers me that the solution to more women in STEM is to try to push more women through this leaky pipeline. Once I got to grad school, I never saw a woman leave due to lack of confidence in her abilities. I saw plenty of women leave due to overt sexism on the part of their supervisors and due to the structural problems that make academics incompatible with childbearing. We shouldn’t be trying to fix these problems on the backs of people who will waste a decade of their lives pursuing this dream only to be forced out by powers beyond their control. As an ex-Ph.D. candidate in History, 50 percent attrition does not seem like a bad thing to me. The academic life is not for everyone, and the fact that some people chose to leave the more they are exposed to it is completely unsurprising. Even for those who complete the Ph.D., job prospects can be brutal, with the very real chance of never getting that tenure track job and being stuck in adjunct professor hell. Not to mention the trouble of finding a job where a significant other could also find employment. I left while writing my dissertation to change fields/lifestyle and got a job on a trading desk in the financial industry. Of my friends in the program who stayed and finished, I would trade places with none of them. While I loved grad school, leaving it was one of the best decisions of my life. In response to the reader who complained that her pay wasn’t even as much as her mechanic friend’s, there’s a reason for that: Her mechanic friend is probably more intelligent. He or she chose a profession that pays and contributes to society. Elites wonder why people vote for Trump, and then offhandedly dismiss blue-collar workers as undeserving. I have no sympathy for her. A blue-collar worker who makes sure he tips his poor PhD baristas well. In response to Nora’s callout for stories about the effects of flat NIH funding: My project went through a period of about one year when my NIH grant was going through the renewal process, during which we had no funding because it just missed getting a fundable score when it was reviewed the first time, and I had to collect additional preliminary data that was requested by the reviewers. But this took longer than expected—or, one could argue, necessary—because, without funding, my lab staff was minimal. I also did not accept any new graduate students into the lab during that time due to the uncertainty. The revised grant was funded, starting last December, but the lapse in continuity has meant we are barely back to full steam now, as I have had to hire and train new people. As Francis Collins, Director of the NIH has said, research is not like an assembly line that can just be shut down and restarted as necessary. But I think there is another, just as important, force at play here: When Congress does not approve a budget before the start of the fiscal year, the NIH plays things very conservatively in terms of awarding grants that have been approved. So, if one’s application was scored close to the cutoff, one may not get the money until very late in the federal fiscal year when Congress finally acts. This again can lead to disruptive gaps. While a PhD student in 2008, I had the privilege of working at a prestigious and dynamic program, the Marine Biological Labs Physiology Course, where I worked on exciting new research with the leading cell biologists in the world. While there I discovered a new method of eukaryotic (mammalian and other high level organisms) cellular organization. It was amazing. It founded a new field of research. I earned my PhD in 2011 and had a postdoctoral position offer from my dream lab, an NIH group that was arguably the best cell imaging lab in the world. I was ecstatic! But the position couldn’t be officially opened until Congress passed the new budget, and sure enough, that is when Congress decided to grandstand about whether they would pass a budget or not … and then shut down the government for an unknown amount of time. Not knowing when I might actually be able to start working and get paid, and with a new baby to support, I had to take a different position. My career has never been the same. The lab I joined folded a year later due to lack of funds. I moved to another lab, where my sole job was to generate “preliminary data” for upcoming grant applications. A year and a half later we finally got stable funding. At that point, 2.5 years out of my PhD, I was already running out of eligibility for fellowships—the lifeblood of postdocs and the prerequisite to even be considered for faculty positions. I earned a fellowship, but the 2.5 years of lost productivity and the lower tier lab I was working in closed the door on me earning an academic position. Funding matters. Congress playing chicken with budgets cost me my career. Instead of using my experience, creativity, and 170+ IQ to prevent gastrointestinal pathogens from ravaging our citizens, now I am trying to figure out how to get a consulting company, scientific equipment sales, or project managing firm to read my resume so I can at least earn a “grown up” paycheck. I am glad the students coming behind me might have a smoother time of it than I did, but I am both skeptical and cynical. My 5-year-old daughter loves science; her face lights up every time she calls herself a scientist … and I am trying to find a way to shift her interest elsewhere. So yes, funding is personal. Indeed it is very personal. To have spent many long nights studying; to have sacrificed a decade of earning power to get advanced degrees and postdoc training; to have put off having biological children until it’s too late, or to have given up time with the children due to 80-hour workweeks; to have endured being thrown under the bus by much higher-paid university administrators; to having trained one’s own grad students and postdocs and watched them fail to get the academic position they had fervently hoped for; to have been embarrassed to teach your classes due to lack of time to prepare lectures with pending grant deadlines; to have written 20 grants for every one funded, and then have the funds cut by 30 percent; to have had to lay off highly-trained staff before funding finally arrives, and then when it does, to have to start all over building a research team, all for an end result of not being able to do the science we were trained to do and end up at age 60 being told we are useless if we cannot get the grants that pay >50 percent overhead for administrator’s salaries … you’re damn right it’s personal. Does this nation really expect to regain our position as a world leader in R&D if it continues down this path? It’s already too late to rescue American science. We scientists QUIT. I am a PhD. Candidate at Miami University in Oxford, Ohio. I work in a lab that was funded until 2011. Since I started in the lab as a graduate student that year, our lab has not been funded by the NIH or any outside source despite showing evidence of being able to transdifferentiate mammalian cells from their normal cell type to a brown adipose tissue like cell. We have demonstrated this in both mouse and human cell lines. More interestingly, we have demonstrated that these cells stop dividing (including a human cancer cell line). Besides various institutional grants and funds, the only funding we have managed to secure is a $500 grant from Sigma Xi. We want to do metabolic studies to see if these cells are behaving like brown adipose and we also want to use a virus to demonstrate this in mice and rats. Our method may be a novel way to treat obesity and cancer and yet we aren’t getting funded. It is slowing down my ability to get data and graduate as a result and potentially harming my future career, but I don’t want to abandon my project, because I absolutely love what I’m researching and can see the potential benefits for humanity. I don’t want to abandon that just for career aspirations. A few years into my post-doc, our lab ran into a period where money was running very low and grants were not getting funded. (I should point out that I work for a small-ish, but well-established and well-regarded lab. In this climate, funding lulls happen to the best of the best.) When a couple of students graduated, they were not replaced, for lack of money. Finally, in order to keep some minimal operations running, my PI had to lay off a post-doc and the lab manager. I stayed on because I had a fellowship supporting my salary. Without that, my career would likely have been completely derailed. Besides me, there was a grad student who was also on a fellowship, and no one else. The grad student and I took over the workload of the lab manager. I had two advanced degrees and post-doctoral training, but spent a significant amount of time on tasks like taking out the garbage and mopping the floor. The grad student was also pulling some seriously long hours to help keep the lab running, but neither of us complained under those circumstances. Lab morale was terrible, and I took a teaching job as a back-up option to research. Meanwhile, the laid off post-doc was not from the U.S., and without a job he lost his visa. He, his wife, and two kids all had to leave the country with almost no notice. My boss scraped together the money to pay for their plane tickets. It was the best he could do. My boss, as many people in science, is thick-skinned and stoic, but I could tell that this situation hit home in a very personal way. Hell, I took it hard too; these were my friends and colleagues being laid off and I was seriously disillusioned about my own future in research. But I think the boss feels an extra responsibility to his team of staff and trainees. Even if you know rationally that there are external factors (like the NIH budget) influencing your ability to bring money into the lab, it’s nearly impossible not to feel personally responsible when your people are underfunded or lose their jobs, their health insurance, their visas. For me, this is the single most terrifying aspect of starting my new job: that other people’s jobs and career progression will depend on my ability to keep the lab funded. I don’t ever want to be in the position that my boss was in, even though it’s highly probable that at some point I will be. It turned out that after surviving on peanuts for a few years, the continued efforts to secure funding for the lab paid off in the form of multiple grants being funded nearly at the same time. More post-docs and a new lab manager have been hired and now, paradoxically, we struggle to spend money fast enough. So things are much better, but clearly this boom-and-bust cycle is incredibly inefficient for the science. We trained a whole new crop of personnel after firing people who were perfectly good at their jobs. It’s personally demoralizing for the PI and it’s potentially career altering for trainees getting laid off. Thank you for taking an interest in this topic that many of us feel so strongly about! Ultimately, those of us who stay in biomedical science do so because we deeply believe that our research will serve society in a meaningful way. Funding levels for science have an impact on how well we can deliver on those beliefs, but there are also very human and personal effects of things that sound large and bureaucratic like the NIH budget. Last month, I posted a callout for biomedical researchers to vent a little. Over the course of my reporting on funding at the National Institutes of Health—the world’s biggest source of biomedical research money—I’d heard from scientists in interviews, in the Atlantic comments section, and on social media about how lackluster funding at the agency crumples careers and hampers scientific progress. But lay people—myself included, once upon a time—might not know why that is. So I asked researchers for more first-person details: How does the agency’s funding, which was flat for more than a decade before last year, trickle down to their labs? And why do they take funding so personally? Before the agency received a $2 billion bump in funding last year, budgets had been flat for more than a decade. In fiscal-year 2017, the NIH looks poised for another increase: A House subcommittee just approved a $1.25 billion boost at a meeting Thursday, and last month, Senate appropriators signed off on a $2 billion increase. ALL the funds to do research (all equipment, personnel salary, consumable costs, publication costs, conference costs etc) are 100% funded by external grants (largely federal NIH/[National Science Foundation] grants). The amount of money budgeted by the federal government for the NSF and NIH has everything to do with what percentage of grants get funded. When funding stagnates, good (even great) grants don’t get funded. So federal funding almost entirely pays for the research that expands our fundamental understanding of the world around us. Federal funding almost entirely pays for the research that expands our fundamental understanding of diseases that kill our loved ones. And less funding cuts short some outstanding chances for advancing both of those efforts. Prachee, who’s completing her first year in a tenure-track position, also explains how the employees running experiments in her lab depend on her pursuing grant money, all while she’s “teaching courses and directing the research of a full lab.” And she depends on those employees to “collect the data to publish papers required to get the grants that will keep all those people employed.” Her employer gives her money for three years to fund her lab, because “my department has acknowledged it’s really hard to get federal grant money.” If she hasn’t secured money from the NIH or other sources when that money runs out, she’ll need to start firing people. There’s tons of competition for less money to go around, so everything we’ve worked our entire lives for … all the young students and trainees who put their faith in us to secure funding for them so they can continue to pursue their careers … all the ideas that could have lead to major advancements in disease therapies … all of that is at the mercy of the funding level. There has been a lot of anxiety in biomedical science in recent years about this situation, and how a whole generation of (potentially groundbreaking) researchers are turning away from the field because of it. I know I did. I got my first R01 [Research Project Grant from NIH] in 2004, but I didn’t earn tenure in 2009, before I had a chance to renew (or not?). I decided to leave science because I could not see starting over in that climate. I’m more than fine now; I have a great job, a happy life, and make more money now with perhaps a little less effort—a little. But I think I have a pretty good perspective on the changes and what they mean. I direct Academic Affairs in a fairly large biomedical PhD program, and I see how different my students’ lives are compared to mine in grad school in the early ‘90s. We never thought about PI [principal investigator] funding, but for my students, it is an ever-present stress that directly impacts their lives. I don’t know where to begin this email. The NIH increase [in June] is too little too late for most postdocs. We need multiple years of funding increases to stay with inflation and to entice the brightest minds to solve some of society’s biggest challenges. I’m a fifth-year postdoc at Harvard Medical School, one of the top research institutes in the country. Yet the mood with other postdocs—the future researchers of the country—is quite grim. Poor NIH funding has meant that academic research positions are scarce, with hundreds of applicants for every job listed. After seeing established scientists whose work I respect close up shop, and peers with multiple Cell/Science/Nature papers struggle to find jobs, it seems time to reassess career paths. Just look at the employment statistics for science PhDs: More and more are leaving for jobs in industry that pay you what you’re worth. (Try living in an expensive city like Boston on NIH postdoc salary.) Many are leaving research altogether or moving to a different country where funding is better. Why do we as a society want the best and the brightest scientists in law or consulting working in other countries entirely? More of your stories soon. When the NIH struggles, biomedical scientists at universities all over the country don’t see even their best grants getting funded. When those grants aren’t funded, researchers pinch pennies in the lab, cut down on staff, or, in some cases, leave science altogether. Heather Duffy, a former assistant professor of medicine at Harvard Medical School, said she never would’ve left the biomedical research field if the grant-funding climate were better. After crafting 18 different grants one year to appeal to peer reviewers, she had the realization that she wasn’t “even doing science anymore,” and left in 2012. I worked in a lab during the NIH boom and bust of 2009-2014. We were forced to spend the grant money in a single year and the result was buying lots of fancy equipment one year with no budget to buy even gloves or petri dishes the next year. No private company would spend 100% of its investor’s money in the first year, so why do we require this of the [NIH-funded] labs? What isn’t likely to change is how personally some researchers take the funding issue. And we want to hear from you science folks out there about why that is: How did those years of flat funding affect you or your colleagues, if at all? Have you even noticed the 2016 increase? And what would more funding mean to you? Please drop us a note at hello@theatlantic.com.